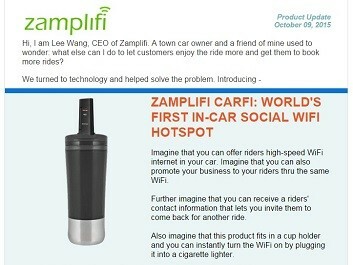 Zamplifi (web site http://www.zamplifi.com ) is a product division of FanZappy, offering world’s leading cloud-based in-store and in-vehicle social WiFi hotspots and associated marketing services. With the launch of Zamplifi CarFi mobile social router product, FanZappy email marketing team developed an email campaign about this new addition to Zamplifi’s product line-up. The target of this email is existing customers and prospect who own or operate commercial vehicles and fleets. Zamplifi team has developed the list database over time on website, on social media, etc. This email is designed as a lead-gen campaign, the goal of which is to obtain as many as inquiries about the product brochure. 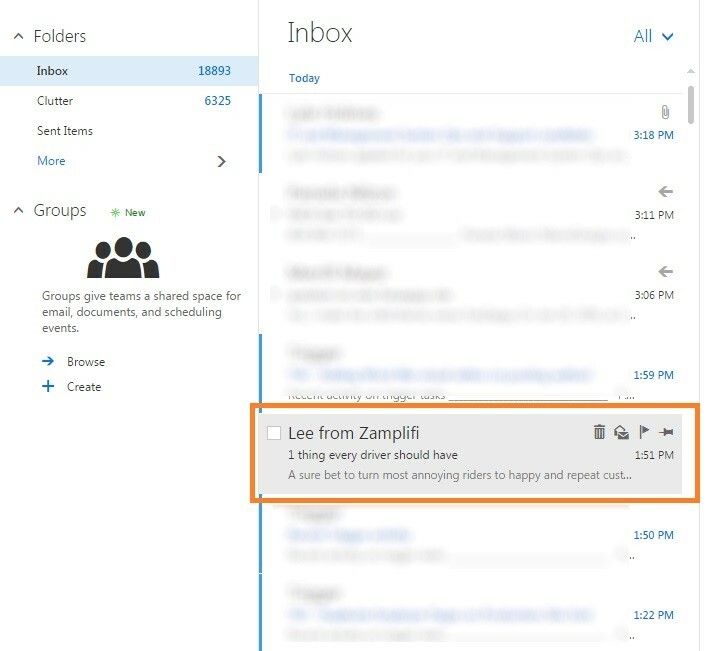 Zamplifi sales team will follow up with such an inquiry with email and phone calls. Heading: We inserted the company logo and named this email a “Product Update” to reflect its informational nature. Introduction paragraph: Be personal. Zamplifi CEO introduced himself then wrote a personal message here. Product section: We placed a large-size product image along with three main benefits of this product. On the last line, we lead users to the call-to-action link. People often make the mistake by giving too much information here that would actually turn away readers. This is the starting point of engagement with readers instead of the entire engagement process. We found that benefits statement play well here. We decided to use the below-the-fold portion of this email to elaborate the benefits, as viewed by both drivers and readers. We separated these two benefit paragraphs with clear sectional boundary, heading and representative images. At the end of each section, we embedded the same “Find out more…” action call. Typically, your email lands in an inbox together with perhaps hundreds or even thousands of other incoming emails. Most modern email clients show these email fields in preview list mode: the From name and address, your Subject line, and maybe a Preheader Text . Think combined they are the “summary” of your email, with which your email is competing for attention with all other emails. Without well crafted subject lines, your email is at risk of only being one-click away from going to the Deleted or Spam folder. A preheader is the text following the subject line when an email is previewed. A preheader is one of the first three items a subscriber sees when viewing an email. Due to the importance of these subject lines, careful consideration was given to each subject line item for this campaign. The key is to being eye-catching but avoid sales words. Subject line: Make it short, standing out but avoid exaggeration. Do not use sales words or heavy punctuation. Test if need to pick up the best one. The one we used in this campaign is the winner over several rounds of user tests. Preheader text: Give one cool sentence about the product or service that gets attention. Keep it short. Please don’t be surprised if more than half of your email recipients are reading their emails on mobile phones and tablets. It is imperative to make sure that your email copy shows well on both desktop and mobile devices. As part of the campaign build process, we tested this campaign across a number of desktop and mobile devices, and across different brands and versions of browsers and email clients. Source of mobile stats: Constant Contact. This email campaign was fully integrated with Google Analytics so we were able to track the performance end to end: from email deliveries, opens, clicks, to landing page visits and lead conversion. We also tracked and calculated leads generated from this campaign and actual sales made on these leads. Comparing revenue generated against the cost of this campaign, Zamplifi reached a high positive Return-On-Investment (ROI) from this campaign.